The USPS will have a temporary postal station at the Hilton on the first and last day: July 28 and August 1 from 10 AM to 2 PM. They will hand cancel mail with an official chess postmark commemorating the tournament! Bring your stamped envelopes and postcards to mail to friends or collect as souvenirs. 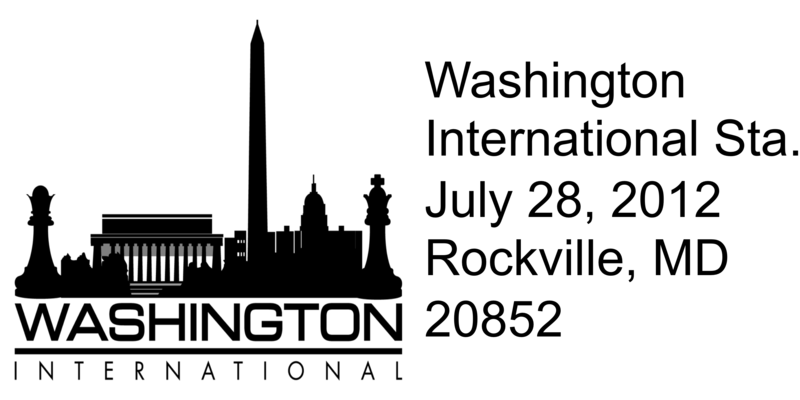 Going into the last round of the 5th Washington International four players were tied with 6/8 (GM Kamsky, GM Holt, GM Moradiabadi, and IM Kiewra) closley followed by five players a half a point behind and it looked like for the first time there would not be a sole winner of the title. But, in the end the only player in the top score group able to win their game was GM Elshan Moradiabadi giving him sole first place and $4000. Five players were equal second, GM Ilya Smirin, GM Gata Kamsky, GM Conrad Holt, IM Keaton Kiewra, and IM Arthur Shen earning them all $1190.